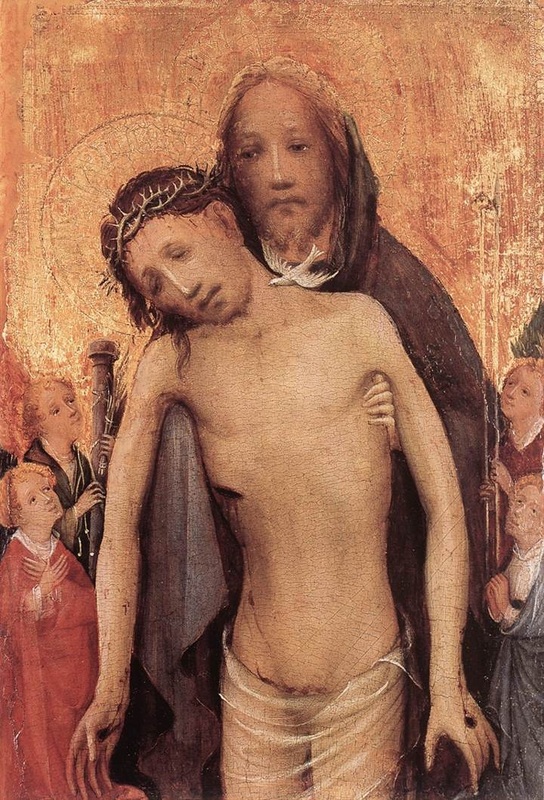 The Man of Sorrows in the arms of God the Father with the Holy Ghost between them both is often termed a Trinity Pietà. The depiction is more common in French and Burgundian court painting from the end of the fourteenth century onwards. In this example, the Man of Sorrows is flanked by four angels, with two of them holding the Flagellation column, the scourge, the stick with the sponge and the lance. The panel is attributed to the Master of Sankt Laurenz (St Lawrence), the pupil of the Cologne Master of St Veronica. It is also assumed that this small panel was the left wing of a diptych having, on the right, a Mater Dolorosa.